Nice replacement accessories for Garmin Vivofit JR and Garmin Vivofit 3 (small size） wristband. Free size that adjust by the button site. Choose different color to change mood in daily life. Wristband ergonomic, durable, moderate softness, very comfortable to wear. Easy to clean with an brush and some dawn. ☛ Search " BeneStellar Garmin vivofit 3 band " for larger size band offered by Getwow Inc store. High quality, fashion, durability and elegance Silicone replacement band designed specially for Garmin Vivofit JR and Garmin Vivofit 3 (small size). Size: 4.3"-6.2" (110mm-160mm) circumference. Easy to adjust the length to fit your wrist. If you think the size is small for your wrist, you can buy Garmin Vivifit 3 band Sold by Getwow Inc. 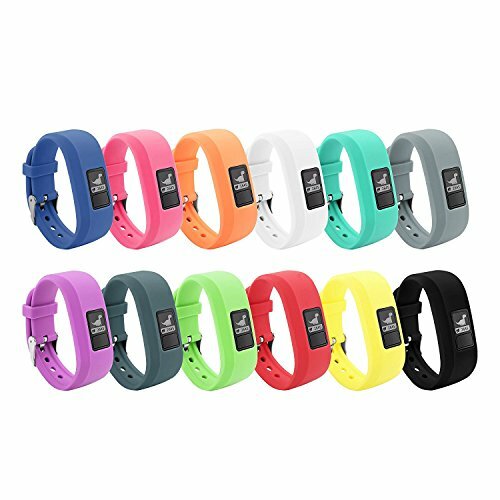 Delighted varied color personalize your wristband to fits your mood and outfits in daily life with this brand new color choices. Package Include: BeneStellar 12-Pack Garmin Vivofit JR bands. If you have any questions about this product by BeneStellar, contact us by completing and submitting the form below. If you are looking for a specif part number, please include it with your message.